Bisphosphonates (BPs) are becoming an emerging strategy for the treatment of Complex Regional Pain Syndrome (CRPS), as confirmed by a recently published systematic meta-analysis , bringing a further support to the evidence that bone-targeting drugs represent a worthwhile choice in the treatment of CRPS  and sustaining a possible pivotal role of bone in CRPS pathogenesis. Even though bone structural changes were reported since the first full descriptions of this disease, the role of bone was disregarded for a long time, investigating rather outer tissues, perhaps easier to approach. A number of evidences are consistent with the central role of bone in triggering and maintaining the early phases of the disease. Firstly, a fracture or trauma possibly causing microfractures and surgery involving the bone are frequently recognized as inciting event in the majority of CRPS patients. Secondly, CRPS that occurs more frequently in postmenopausal women, is significantly associated with osteoporosis, namely in patients who more often suffer from fragility fractures . Consistently, CRPS is reported in patients with clinical disorders characterized by skeletal fragility, with a high propensity to fractures . Quite always bone scintigraphy and sometimes magnetic resonance imaging (MRI) show a specific pattern in early stages of the disease, consistent with an overt bone involvement. Plan radiography detects skeletal changes later in the CRPS course, in variable percentage, but with specific features not simply evoking a disuse osteoporosis. Furthermore, the animal model that more closely resembles human CRPS is induced by tibial fracture. Lastly, osteoprotegerin, a molecule involved in bone metabolism regulation trough RANK/RANKL system, is overexpressed in CRPS . The role of bone due to a direct injury  or a microvascular insult (i.e., ischemia/reperfusion phenomenon , may be related to the production of several inflammatory mediators (i.e., TNFα, IL-1, and IL-6). These cytokines are found to be significantly increased in CRPS patients both locally and in systemic circulation and the bone itself would be a possible source. A few weeks after the onset of CRPS, features of bone marrow vascular disorder, such as adipocytes necrosis and plasma exudation with venous dilatation and thickening of the arteriolar walls, are observed ; a mineralization disturbance might be the basis for the impressive loss of bone density, assessed with different techniques. Bone loss quickly appears after disease onset, and it is so quantitatively significant that cannot be only justified by an osteoclast-mediated process. Possibly, a hydroxyapatite chemical dissolution related to tissue hypoxia, an increased anaerobic glycolysis, and lastly, a low local pH overcoming the local buffering capacity may be the pathogenic steps . Also, peptidergic fibres that innervate both mineralized bone and bone marrow can retrodromically release neuromediators, like substance P and Calcitonin gene-related peptide, which are detected at high levels in CRPS and are able to trigger and maintain a microvascular disorder found at any tissue level of the disease . Taking into account the above, the use of bone targeting drugs in CRPS seems to have a rational, even though there is a curious paradox on this issue. Calcitonin firstly, and then BPs, have been used to inhibit osteoclasts, which were believed responsible for only one feature of the disease, such as the regional osteoporosis. However, neither histopathological , nor biochemical  studies never demonstrated an enhanced osteoclastic activity. Notwithstanding, an increased bone turnover continues to be erroneously considered responsible for the bone scintigraphy increased uptake. Beyond the well-known anti-osteoclastic properties, BPs can exert their benefits through other mechanisms . As can be inferred from bone scan features with radiolabeled BPs, the pharmacokinetic profile of these drugs shows a significant local accumulation and it is not surprising that BPs can exert an anti-inflammatory effect, particularly in early stages of the disease, when more frequently bone scan shows an enhanced uptake and BPs can exert a cytotoxic effect on inflammatory cells. Consistently, BPs are more effective in the early stage of disease , when more frequently bone scan shows an increased uptake in bone phase, whereas they lose effectiveness in later stages of disease (Fig.1), when a reduction of radiolabeled BPs uptake is usually observed: in these patients, a poor therapeutic response could be related to a lower local drug concentration. Fig 1. Rates of CRPS-1 responders by disease duration (Percentages of CRPS-I responders to I.V. bisphosphonate treatment according to disease duration in months as observed in a sample of 194 patients). 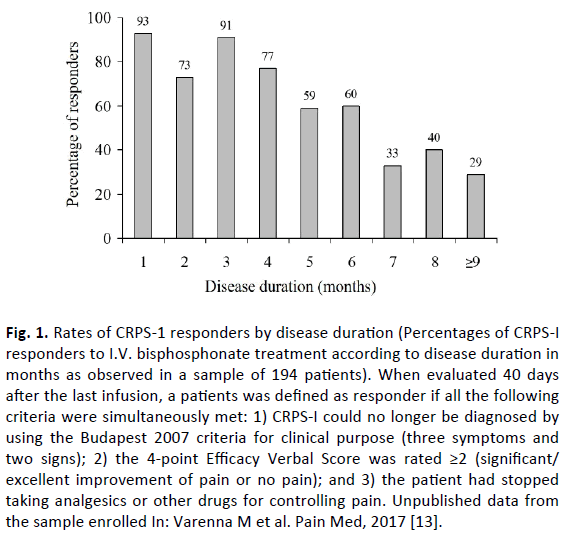 When evaluated 40 days after the last infusion, a patients was defined as responder if all the following criteria were simultaneously met: 1) CRPS-I could no longer be diagnosed by using the Budapest 2007 criteria for clinical purpose (three symptoms and two signs); 2) the 4-point Efficacy Verbal Score was rated ≥2 (significant/ excellent improvement of pain or no pain); and 3) the patient had stopped taking analgesics or other drugs for controlling pain. Unpublished data from the sample enrolled In: Varenna M et al. Pain Med, 2017 . As aforementioned, excluding high skeletal turnover as a possible explanation of BPs local accumulation and therapeutic effect, pathophysiological mechanism of high drug uptake at disease site is more likely related to other mechanisms. Some literature data demonstrated that a bone microvascular disturbance could determine lining cells death, exposing a number of available binding sites on the uncovered trabecular bone surface . Giving this hypothesis, all BPs could probably exert a therapeutic effect when used in the early phases of disease if administered at sufficient dosage to act as anti-inflammatory. It is not surprising that results from a recent animal model study have shown that different BPs molecules, by different ways of administration, reduce pro-inflammatory cytokines and improve clinical signs of the disease . Despite of these issues, some specialists (i.e., neurologists or algologists) rarely use BPs. Maybe, they more often face long-standing diseases, where overt inflammatory features are already disappeared and BPs therapeutic “window of opportunity” is expired, because of a shift toward a chronic disease. Furthermore, safety concerns should not be raised: in fact, BPs have till now no reported serious side effects, such as osteonecrosis of the jaw or atypical fractures, when used at CRPS therapeutic regimens. Finally, on the basis of the results of a RCT on 82 patients  in 2014 Neridronate has been registered as a specific treatment for CRPS in Italy and a registration trial is ongoing in USA (NCT02402530), recently receiving the breakthrough designation. All these speculations support the hypothesis that bone plays a central role in CRPS pathogenesis and that BPs could be effective in treating CRPS, as long as proper molecules and dose regimens are used. However, this extremely painful disease, possibly long-standing and invalidating, need to be treated at early stage, when BPs exert their whole therapeutic effect. Chevreau M., Romand X., Gaudin P., et al. : Bisphosphonates for treatment of complex regional pain syndrome type 1: A systematic literature review and meta-analysis of randomized controlled trials versus placebo. Joint Bone Spine. 2017;84:393-399. Wertli M.M., Kessels A.G., Perez R.S., et al. : Rational pain management in complex regional pain syndrome 1 (CRPS 1)-a network meta-analysis. Pain Medicine. 2014;15: 1575-1589. De Mos M., Huygen F.J., Dieleman J.P., et al. : Medical history and the onset of complex regional pain syndrome (CRPS). Pain. 2009;139:458-466. Bouvier M., Colson F., Noel E., et al. : Two new case-reports of reflex sympathetic dystrophy syndrome in patients with osteogenesis imperfecta. Review of the literature. Rev RhumEngl Ed. 1997;64:202-204. Kramer H., Hofbauer L.C., Szalay G., et al. : Osteoprotegerin: A new biomarker for impaired bone metabolism in complex regional pain syndrome? Pain. 2014;155:889-895. Loi F., Cordova L.A., Pajranen J., et al. : Inflammation, fracture and bone repair. Bone. 2016;86:119-130. Coderre T.J., Bennett G.J. : A hypothesis for the cause of complex regional pain syndrome-Type I (Reflex Sympathetic Dystrophy): Pain due to deep-tissue. Pain Medicine. 2010;11:1224-1238. Arlet J., Ficat C.C.J. : Vascular explorations and pathology of reflex sympathetic dystrophy. Baillere’s Clin Orthop. 1996;2:273-290. Birklein F., Weber M., Neundörfer B.: Increased skin lactate in complex regional pain syndrome: evidence for tissue hypoxia? Neurology. 2000;55:1213-1215. Basle M.F., Rebel A., Renier J.C.: Bone tissue in reflex sympathetic dystrophy syndrome - Sudeck’s atrophy: structural and ultrastructural studies. Metab Bone Dis Relat Res. 1983;4:305-311. Varenna M., Zucchi F., Ghiringhelli D., et al. : Intravenous clodronate in the treatment of reflex sympathetic dystrophy syndrome. A randomized, double blind, placebo controlled study. J Rheumatol 2000;27:1477-1483. Varenna M.: Bisphosphonates beyond their anti-osteoclastic properties. The lesson of complex regional pain syndrome. Rheumatology (Oxford). 2014;53:965-967. Varenna M., Manara M., Rovelli F., et al. : Predictors of responsiveness to bisphosphonate treatment in patients with complex regional pain syndrome Type I: A retrospective chart analysis. Pain Med. 2017;18:1131-1138. Wang L., Guo T.Z., Wei T., et al. : Bisphosphonates inhibit pain, bone loss, and inflammation in a rat tibia fracture model of complex regional pain syndrome. Anesth Analg. 2016;123:1033-1045. Varenna M., Adami S., Rossini M., et al. : Treatment of complex regional pain syndrome type I with neridronate: A randomized, double-blind, placebo-controlled study. Rheumatology (Oxford). 2013;52:534-542.